MY SALTWATER FLIES ARE IN THE GALLERY! I hope you enjoy my gallery of Saltwater Flies. All the flies on my site were designed by me to catch Striped Bass, Blue fish, Tuna, and Albacore, that all swim in Cape Cod waters. I am sure that these saltwater flies will catch other species of fish in other States and waters. This gallery of Saltwater Flies was designed for your enjoyment, but mainly for Charter Boat Captains, Bait Shops, Fly Guides, and persons who are in the retail business of fly fishing. All saltwater flies are sold by the dozen, with a $100.00 minimum order. If you call 508-398-0512 between 9 AM. - 5PM. 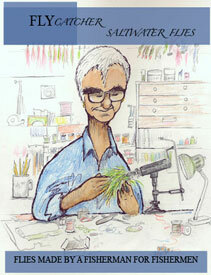 Monday thru Friday I will be happy to discuss my saltwater flies, and their prices. I am a custom tier, and I am happy to cater to your needs. "Flycatcher Flies | Saltwater Flies" are tied the old fashion way.... one at a time. All of the saltwater flies are tied by one person, using only the best materials and hooks available. Results have shown that fisherman that use flycatcher flies have caught more fish with less effort. Every fly pattern is field tested under actual fishing conditions to see if it will catch fish, and to see how the fly performs in the water. Corrections are made at this stage before any production begins. These saltwater flies are glued at least five times or more during the tying process to give you the strongest built flyavailable. From time to time the pattern and color of the fly may slightly change. Please do not become alarmed at this. Through research, I may have found a better way to tie the saltwater fly, or the manufacturer of the hair products has changed their colors slightly. There is no need to worry. They will still catch fish. "I would not sell any saltwater flies that I would not fish with myself"
"I hope that you have as much fun catching fish with them as I had making them for you"
Saltwater Flies that have the scent of a fish? Check out this site to add scent to any of your saltwater flies. You can add a scent to any flies that you purchase or make yourself.